Do not load items on the basic carrier bars. It may cause instability during some maneuvers which could result in an accident. Drive slowly in unknown terrain. This will make it easier to recognize unexpected obstacles and avoid damage to the vehicle. To help avoid the vehicle rolling over, never turn it around on steep inclines. If the vehicle cannot complete the attempted climb, back it down in reverse gear. Do not drive along the side of a slope. The vehicle might otherwise rollover. If in doing so the vehicle begins to show a tendency to roll, immediately steer into a line of gravity (straight up or downhill). Never let the vehicle roll backwards in idle. You may lose control of the vehicle if you use only the service brake. For information on driving downhill, see "Driving downhill". Environmental note Protection of the environment is of primary importance. Treat nature with respect. • ANGE before driving offroad. • AMG vehicles: to shift the transfer case to LOW RANGE, deactivate the ECO start/ stop function . ABS, 4ETS, ESP® and BAS are deactivated when the differential locks are activated. This allows the front wheels to lock briefly, so that these can dig into a loose surface. However, please note that locked wheels skid and can no longer steer. R Check that items of luggage and loads are stowed safely and are well secured . • To avoid damaging the vehicle, make sure there is always sufficient ground clearance. • Drive slowly and evenly, if necessary at a walking pace. • Ensure that the wheels are in contact with the ground at all times. • Drive with extreme care on unknown offroad routes where visibility is poor. For safety reasons, get out of the vehicle first and survey the off-road route. • Look out for obstacles such as rocks, holes, tree stumps and furrows. • Always keep the doors, rear door, side windows and the sliding sunroof closed while the vehicle is in motion. R Switch off cruise control. • Do not stray from marked routes or paths. • On sand, drive quickly to overcome the rolling resistance. Otherwise, the vehicle could dig itself into the sand. • Avoid high engine speeds. Drive at appropriate engine speeds (maximum 3,000 rpm). • Always check the vehicle for damage after off-road driving. Information about retrofitting special allterrain tires is available from any qualified specialist workshop. ► Engine oil level: check the engine oil level and add oil if necessary. Only then does the engine receive enough oil when the vehicle is standing on a steep incline. ► Tire-changing tool kit: check that the jack is working and make sure you have the lug wrench, a robust tow cable and a folding spade in the vehicle. ► Wheels and tires: check the tire tread depth and tire pressure. ► Check for damage and remove any foreign objects, e.g. small stones, from the wheels/tires. ► Replace any missing valve caps. ► Replace dented or damaged wheels. ► Carry a sound spare wheel. ► Shift the transfer case to HIGH RANGE. ► Disengage the differential locks . ► Clean the headlamps and rear lights and check for damage. ► Clean the front and rear license plates. ► Clean the wheels and tires with a water jet and remove any foreign objects. ► Clean the wheels, tires, wheel housings and the vehicle underside with a water jet; check for any foreign objects and damage. ► Check whether twigs or other parts of plants have become trapped. These increase the risk of fire and can damage fuel pipes, brake hoses or the rubber bellows of the axle joints and propeller shafts. ► After the trip, examine without fail the entire undercarriage, wheels, tires, brakes, bodywork structure, steering, chassis and exhaust system for damage. ► After driving for extended periods across sand, mud, gravel, water or in similarly dirty conditions, have the brake discs, wheels, brake pads/linings and axle joints checked and cleaned. ► If you notice strong vibrations after off-road driving, check for foreign objects in the wheels and drive train and, if necessary, remove them. Foreign objects can disturb the balance and cause vibrations. • Shift the transfer case to LOW R ANGE. • Limit the shift range of the automatic transmission according to the off-road conditions. • Drive quickly to overcome the rolling resistance. Otherwise, the vehicle could dig itself into the sand. • Drive in the tracks of other vehicles if possible. Make sure that the ruts are not too deep, that the sand is firm enough and that your vehicle has sufficient ground clearance. R Shift the transfer case to LOW RANGE. 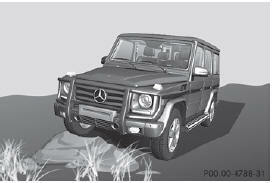 • Observe the safety notes and the general notes on off-road driving. • Restrict the shift range of the automatic transmission to 1. Drive with particular care when driving over an obstacle while driving up or down a steep slope. The vehicle could otherwise tilt and slide sideways or tip over. • Restrict the shift range to 1. • Make sure that you have enough ground clearance before driving across an obstacle. • Try to drive straight over the center of obstacles: front wheel first, then rear wheel.